The Shell Malaysia LiveWIRE programme offers aspiring East Malaysian entrepreneurs the opportunity to develop themselves and grow their respective business ideas. Successful applicants will undergo a series of workshops and a pitching competition, and winners will receive a RM10,000 seed grant and 3 years of mentoring. The Shell LiveWIRE program was established in 1982 in the UK by Royal Dutch Shell. It is a program that offers free workshops and funding to young entrepreneurs with the objective of tackling unemployment issues in areas of Shell’s operations. Since 1982, the LiveWIRE programme has been introduced in various countries all over the world, creating a global network of entrepreneurs who have all undergone the same trainings. In Malaysia, the Shell LiveWIRE programme is focused at growing entrepreneurs from the communities of Sabah and Sarawak. Since 2015, Shell Malaysia, with the help of their delivery partners, has conducted the LiveWIRE programme in Sabah, crossing the borders into Sarawak in 2016. As a LiveWIRE winner, you will receive a RM10,000.00 grant for the benefit of growing your business. Winners also receive three years worth of coaching from the programme’s incubation partners as part of the post-startup phase of the programme. If YOU want to be a LiveWIRE winner and see your business idea become a reality, register for a Bright Ideas workshop now, taking place in Miri, Bintulu, and Kuching, in Sarawak, and Kota Kinabalu and Penampang, in Sabah. Through the Shell LiveWIRE program, we hope to seek out innovative business ideas that hold the potential of changing the world around us. We do this by supporting visionary entrepreneurs in their ambitions, turning their entrepreneurial dreams into a reality, leaving a lasting positive legacy in Sabah and Sarawak. DURATION: 4 minutes 4 seconds. [VISUAL] An animation of “Shell liveWIRE Kickstarting Bright Ideas” appears on a white background. [AUDIO] Dramatic electronica music plays in the background. [VISUAL] Slow zoom in view from the rear of a meeting room full of participants attending the livewire session. [TEXT BOX DISPLAY] A bright yellow caption box appears to the left bottom part of the visual with the title “2016 Bright Ideas Workshop” in red, and “Kota Kinabalu” in black. [VISUAL: MONTAGE SEQUENCE] Visual of participants’ activity during the liveWIRE session: pinning up sketches, sketching ideas in a group and a wide shot of the whole training room with the groups standing and sketching at their own table. [VISUAL] Medium shot of the interview with Alvin Chia, Livewire Programme Manager. [AUDIO: VOICE OVER] Alvin Chia, Livewire Programme Manager. [SUBTITLE DISPLAY] Hi there, my name is Alvin Chia and I am the Programme Manager for the Shell Malaysia Livewire Programme. [VISUAL: MONTAGE SEQUENCE] Visual of 2 groups of participants crowding around tables during the livewire session, cut to a visual of the interview and a presenter at the podium. [SUBTITLE BOX DISPLAY] The Shell LiveWIRE Programme is a world-class entrepreneurial development programme that has been in the Shell system in 1982. [VISUAL: MONTAGE SEQUENCE] Close up of a participant rolling a large sketch paper on a table and a wide shot of participants folding and carrying their sketches during the livewire session, ends with a visual of the interview. [SUBTITLE BOX DISPLAY] We started it in Malaysia in 2015 and I am very happy to say that this is the second year that we are running it in full steam. [VISUAL: MONTAGE SEQUENCE] Close up of a participant sketching a large sketch paper on a table and a medium shot of participants sketching their ideas during the livewire session, ends with a visual of the interview. [VISUAL] Interview of Ayisha Arshad. [AUDIO: VOICE OVER] Ayisha Arshad, Shell Malaysia. [SUBTITLE BOX DISPLAY] do not have the skill and knowledge to develop that bright idea into a viable business. [VISUAL: MONTAGE SEQUENCE] Multiple angle shot of participants sketching and writing their ideas. End with cut to the interview. [SUBTITLE BOX DISPLAY] Shell LiveWIRE gives you the knowledge and the know how on how to develop a start up business for young people. [VISUAL: MONTAGE SEQUENCE] Participants viewing what their group wrote, a facilitator giving instructions, and a wide shot to show activities in the room during the session. [VOICE OVER] Alvin Chia, Livewire Programme Manager. [SUBTITLE BOX DISPLAY] The LiveWIRE programme is a holistic programme that does not stop at the end of the workshop. [VISUAL] Medium shot of Alvin Chia’s interview. [SUBTITLE BOX DISPLAY] Successful winners will then receive a RM10,000 seed fund alongside a one year mentorship programme by our very experienced facilitators. [SUBTITLE BOX DISPLAY] Animated line-by-line sweep in text from top left to bottom right. Shell Malaysia LiveWIRE 2017 Winners title. Points: 5 winners from both Sabah & Sarawak. RM10,000 seed grant per winner. 1 year mentorship programme. 2 years performance monitoring. [VISUAL: MONTAGE SEQUENCE] Wide shot of training session, where facilitator is delivering a presentation. A closer shot of the facilitator, ends with the interview shot. [SUBTITLE BOX DISPLAY] On top of that one year, they also receive an additional two years performance monitoring to help them adjust their targets for their respective business. [VISUAL: MONTAGE SEQUENCE] A view of a busy intersection in the city of Miri, Sarawak. All the state flags flying on flagpoles. The Grand Old Lady, the first drilling well in Malaysia. 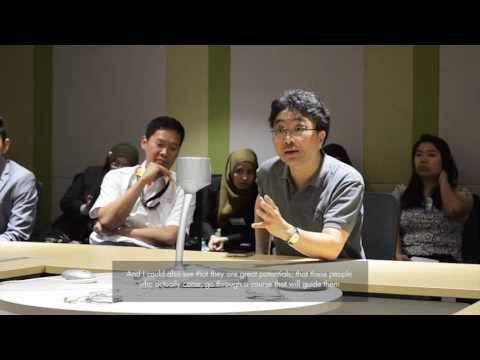 [AUDIO: VOICE OVER] Adam Yii Siew Sang, Miri City Council and Mayor of Miri City. [VISUAL] Medium shot of the Mayor Adam Yii Siew Sang during the interview. [TEXT BOX DISPLAY] ADAM YII SIEW SANG, MIRI CITY COUNCIL, MAYOR OF MIRI CITY. [VISUAL: MONTAGE SEQUENCE] The Mayor giving a talk during a livewire session. A participant interacting with the Mayor. [SUBTITLE BOX DISPLAY] programme is to identify, mentor and nurture these young entrepreneurs. [VISUAL] Medium shot of the Mayor Adam Yii Siew Sang during the interview. Cut to the Mayor presented with a memento and back to the interview shot. [SUBTITLE BOX DISPLAY] and in a way much like the venture capitalist way of doing things except that Shell is not making money out of this and it is purely on a voluntary basis. [VISUAL: MONTAGE SEQUENCE] Participants presenting their ideas in a livewire session. [VISUAL] Map of Sabah and Sarawak with animated red pins showing the location of Kuching, Miri, Bintulu and Kota Kinabalu. [SUBTITLE BOX DISPLAY] than a hundred participants; Young, budding entrepreneurs with bright ideas. [VISUAL] Medium shot of Alvin Chia’s interview. Facilitator delivering the training in front of participants. Wide shot of participants at their desks listening to the training. Medium shot of Alvin Chia’s interview. [SUBTITLE BOX DISPLAY] And out of this more than a hundred, we brought over more than 50 participants to participate in the Become a Successful Owner Manager (BSOM) workshop. [VISUAL: MONTAGE SEQUENCE] Wide angle shot of participants in groups standing and sketching ideas on large sheets of presentation papers. 2 seated participant facing each other, discussing. [SUBTITLE BOX DISPLAY] receive the RM10,000 seed fund as well as the one year’s worth of mentorship. participant, Sebastian Lim with two participants in the background. [VISUAL] Medium shot of interview with the attentive participant above. [AUDIO] Voice over of Sebastian Lim, one of the participant. [SUBTITLE BOX DISPLAY] Generally always when you talk about the ideas and business, people will tell you to protect your ideas; Sign disclosures before you even talk to people about your ideas. [WHITE TEXT BOX DISPLAY] SEBASTIAN LIM. SHELL LIVEWIRE 2016 Winner. Rajah Juice Co.
[VISUAL: MONTAGE SEQUENCE] Participants at a table, one of them spreading a large sketch paper on one side of the table. Medium shot of Sebastian Lim’s interview. [SUBTITLE BOX DISPLAY] you would get more back when people contribute to your ideas. [VISUAL: MONTAGE SEQUENCE] Two participants writing on a piece of sketch paper on a table. A participant writing on a sketch paper posted up on a wall. [SUBTITLE BOX DISPLAY] I thought that was very powerful. The network that you get from Bright Ideas. I thought that was brilliant. [VISUAL: MONTAGE SEQUENCE] A facilitator and a participant discussing about the posted ideas in front of them. Medium shot of Sebastian Lim’s interview. [SUBTITLE BOX DISPLAY] A group of people who share the same interest of making a change in Miri building their own businesses and things like that. [SUBTITLE BOX DISPLAY] I thought that was very nice. I don’t feel that alone anymore in Mri. [VISUAL: MONTAGE SEQUENCE] A group of participants having a discussion during a coffee break at the café. Close up shot of seated Ayisha Arshad from Shell Malaysia explaining something to the participants in front of her at cafe. Sebastian Lim nodding facing Ayisha Arshad. Interview shot of Sebastian Lim. Sebastian Lim and 3 other male participants laughing at a café table. Sebastian receiving a mock cheque from Adam Yii, the Mayor of Miri. [AUDIO] Voice over of Mayor Adam Yii. [SUBTITLE BOX DISPLAY] I am very encouraged to see that there are so many young people are so enthusiastic to want to start their own business. [SUBTITLE BOX DISPLAY] And I think that this is good for Miri. And to these young entrepreneurs, I wish them all the best and I hope they will succeed in what they are doing. [VISUAL: MONTAGE SEQUENCE] Interview of Mayor Adam Yii. Two angles of the facilitator facing the participants in a classroom session. Back to Mayor Adam Yii’s interview. Mayor talking to a female participant. Mayor giving a certificate to Sebastian Lim. Back to Mayor Adam Yii’s interview. Three shots of group of participants showing their excitement. [VISUAL] Interview of Ayisha Arshad. Facing the camera squarely. [AUDIO] Voice over of Ayisha Arshad. [SUBTITLE BOX DISPLAY] Young Sabahans and Young Sarawakians do not hesitate. Do not be shy. Seize the opportunity. [SUBTITLE BOX DISPLAY] Come and join Shell LiveWIRE and I guarantee you, it will change your life. [VISUAL] An animation of “Shell LiveWIRE Kickstarting Bright Ideas” appears on a white background. FADES TO WHITE. [VISUAL] Shell Pectin appears in the centre of the screen with a very short fanfare music playing.